People traveling from Santa Clara and the entire San Francisco Bay Area are within easy reach of 9 of California's best whitewater rivers. For example, just a 3 hour drive gets you to the Class III-IV rapids of the forks of the American River, or the Wild and Scenic Tuolumne River canyon. 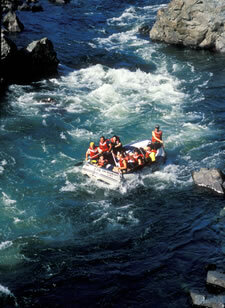 First-time rafters and people vacationing with kids flock to an American River rafting trip on either the South Fork or Middle Fork of the American River; both are an approximately three hour drive from Santa Clara. In addition to the Tuolumne River, visitors traveling to the Yosemite area can run the Class IV rapids of the Merced River. People looking for the ultimate whitewater challenge can brave the Class V gauntlet of Cherry Creek, California’s most difficult commercial river and an easy drive from Santa Clara.